In some ways, this same concept is reflected in “With Love and a Major Organ,” now at The Theatre at Boston Court. Isolation as safety, distance as lifestyle, and electronic communication as the only social contact are the norms as the play opens. Then a woman on a subway makes contact with a man safe in his isolation, and begins sending him long, poetic outpourings of enthusiastic interest, by way of acknowledgedly outmoded cassette tapes. The results are funny, insightful, and end up saying much more about the heart and human interaction than simply being a quirky, poetically symbolic love story. Paige Lindsey White is the subway rider, giving her a physicality as effusive as her prose, and a depth of enthusiasm which one discovers has been contagious when it suddenly disappears. Daisuke Tsuji is George, the young man whose detached and regimented life White’s character is bent on reforming. Tsuji manages to make the young man distant and passive while still giving him a directness and sense of self. The two play off against each other in ways which make the central themes of the play come alive. Still, some of the funniest moments come thanks to Bonita Friedericy, as George’s mother Mona. The character, having protected her son from heartbreak as he grew, finds herself reaching out without reaching out: using the computer as a distance-maker for everything from romance to psychology. As she and the other two characters perform an intricate dance of feeling and separation, empathy and distance, enthusiastic embracing of the world and deadened indifference to input, they illustrate – in fascinatingly, symbolically graphic ways the complexity of the human heart. Director Jessica Kubzansky has a feel for such sweetly intricate plays, never letting the frothy surface obscure the important elements running just underneath. Her utilization of Francois-Pierre Couture’s scenic structure, simple in style, rich in animations underscoring the many moods of the piece, adds to the otherworldly ordinariness of the enterprise. In the process the humanity of it all takes center stage: the innate need for connection which is how we as a species become whole. Playwright Julia Lederer’s play, which debuted in Canada in 2012, was prescient when it comes to some of the details of our modern social media-based existence. The stolid character’s mother, having protected her son from heartbreak as he grew, connects to a computerized psychologist through Google, and tries speed dating through fairly anonymous websites. Both are now actually possible in ways they were not when Lederer thought them up. Plus, the need for connection and the ways technology has created the ability to avoid it are here as well. Those high school students confirmed it, at least for their own generation. What then could be more important than seeing a play like “With Love and a Major Organ,” with its insistence that one’s heart, in real time, is central to everything. There are two ways to approach Dan O’Brien’s “The House in Scarsdale: A Memoir for the Stage”. One can look at it as just that – a memoir created by gradually collecting as many as possible of the secrets a family never told. In this view, the show becomes an elaborate puzzle made up of the various reticent members of a deeply dysfunctional family which gradually come together to underscore the demons inhabiting the playwright himself. That works, after a fashion. The other view, however, which can be far more intriguing, is to look at the entire play as the story of a quest: the kind of quest where the searching is everything. It allows for conjecture and obsession and self-affirmation, but is also a thing in itself which becomes integral in the quester’s view of the world. Now receiving its premiere at The Theatre at Boston Court, the play is far more interesting in the latter view. Here it takes its place alongside other questing folk of story and legend who defined themselves by the search, not the finding. Like the unsuccessful search for the Holy Grail (sorry, Indiana Jones fans), the journey was the story all along. Finding the thing being searched for would (and is) almost pointless. The questing, and the questions, make the story. O’Brien, according to this work, is the youngest of six children, none of whom (as the play begins) he has contact with. He has been cut off by his parents as well, and his aunts have been told not to speak with him. How a family could reach this state is one question, but as he pursues the whys and reexamines his own memories, it is the search as much as the purpose of it which is most interesting to follow. Is he looking for a verification of his own sanity in a family short on just that? Is he looking for a reason why his marriage is in trouble? Is he trying to reconstruct a sense of family? Or, is he in love with the search itself as a symbol of his own identity as a seeker? This last begins to seem more and more clearly the answer as the tale unfolds. All of this is presented on a nearly empty stage by two men. One, the Dan played by Brian Henderson, becomes the protagonist on the quest, narrating his own story as he calls, writes, visits and pieces together with private detectives and psychics the story of himself. The other, the Dan played by Tim Cummings, is sometimes the argument inside the protagonist’s head, as well as becoming all the people on the other end of the quest’s questions and investigations, at least as Dan remembers them. For both men this is a tour-de-force, performed without intermission in an inexorable forward motion rife with adventure, anger, frustration, and a certain joy of the chase. Director Michael Michetti wisely allows this tale to play out with a minimum of distraction and a maximum of the actors’ art. The set by Sara Ryung Clement is two chairs and two screens upon which are projected a few photos – some out of focus, which makes its own point – as well as innumerable drawings which illustrate the remembrances and mental architecture that the protagonist constructs. Indeed, these projections, designed by Tom Ontiveros, become, themselves, a character in the piece. What is real? What is dim recollection? What is conjecture? What is pure fantasy? “The House in Scarsdale” was workshopped at several prestigious institutions, including the Center Theatre Group, while in the process of completion. The results are fascinating watching, even if the ending is, at best, a hanging one. There are several layers to Idris Goodwin’s play “Bars and Measures”, just opened at The Theatre at Boston Court as part of a “rolling premiere.” Several themes relating to identity, race, faith and cultural attributes float together in a kind of orchestrated wrangle between brothers over what truth is, what art is, what justice is, and what limits family loyalty might have. The play proves intense, and leaves one with a lot to chew over, but its spare direction by Weyni Mengesha lets all these topics shine with a specific clarity. The tale centers on two brothers. One, a respected jazz artist and convert to Islam currently in jail awaiting trial, and the other a Juilliard graduate more comfortable with classical music, trying to learn his brother’s music both as a form of family bonding, and as a way to support what he believes to be his brother’s innocence. One is learning the struggles, indignities, and hardenings of incarceration. One is stretching out of a comfort zone and internalized prejudices to attempt understanding the world through his brother’s lens. Both, being African-American, face internal debates about where and with whom they fit. Matt Orduna gives Bilal, the brother in prison, a kind of elemental dignity which carries him through the torments and prejudices of imprisonment and gives gravitas to the character’s composing life. Donathan Walters finds an interestingly middle stance in Eric, as a conventional guy trying to balance a satisfyingly conventional life with the edginess of both his brother and the jazz music he is learning to both appreciate and perform. As both the FBI agent who set Bilal up, and a series of correctional officers, Brian Abraham vibrates with a strength and confidence which make him dominatingly convincing. Zehra Fazal creates, in the opera singer Eric shares his musical world with, yet another balance – this time of honoring cultural traditions yet embracing the wider modern world. Still, the focus is on the two brothers and the gut-level expression of the jazz which both works to unite them, and to explain their elemental differences. In this – the scatting which becomes its own communication – Orduna and Walters excel. It becomes one of the elements which deepens the storyline far beyond the actual plot. Indeed, the play’s layered nature, and what it has to say about manipulation, prejudice and trust must be unpacked over time. But then that is what one expects of plays at Boston Court: works which take thought even after the show is over. Central to the intricately layered storyline of Roland Schimmelpfennig’s “The Golden Dragon”, is the Aesop’s fable of the ant and a cricket. This is not surprising when the observer begins to realize that this entire play is in many ways the story of a human ant hill: a single building of several stories, anchored by the eponymous, miscellaneously Asian restaurant at its base. It is the story of busy workers, the fragility born of immigrant status, and the particular privilege those who do not spend their days looking over their shoulders bring with them into this almost closed society. Still, in the production now at The Theatre at Boston Court in Pasadena, the first thing one becomes fascinated by amid the complexity of intertwining tales is the show’s staging. Five actors of disparate ages, genders and ethnicities play all the many people who populate the play, often doing so completely against type and sliding in and out of story and personhood with the efficiency and élan of a beautiful machine. The production proves remarkable to watch from that aspect alone, though director Michael Michetti has utilized this talented group to create one engrossing individual after another. The most obviously interesting of the many, many portraits take the actors beyond gender. Justin H. Min creates the fragile “cricket” – a young woman held captive by a manipulative old man played by Ann Colby Stocking. Joseph Kamal and Theo Perkins are female flight attendants whose dinner at the restaurant comes up short when one of them makes an odd find in her soup. Susana Batras creates an immigrant Chinese kitchen boy whose rotting tooth becomes a problem for the entire kitchen staff of The Golden Dragon to deal with. In each case, and more, their portraits are intricately convincing – truly an homage to the power of live theater’s ability to let the imagination work. The individual tales, of the cricket, the lascivious drunken shopkeeper, the adoring couple torn apart by an unexpected pregnancy, the old man dreaming of things he cannot have, the flight attendants’ meaningless relationships, and always that kitchen staff trying to figure out what to do with the howling young man, slide in and out of focus, shifting in waves back and forth. It is as if a classic play like “La Ronde,” in which individual characters link one separate scene to the next until there is a circle, had been set on its ear, with all the scenes sliding together and playing almost at once. And again, what makes this work is the quality and timing of the cast and the impressive rhythm of Michetti’s direction. As the play, which is performed without intermission, flows over the audience more is absorbed than can be processed right away. That is also a tradition of Boston Court: plays which must be pondered afterward. Also worth a nod is the Brechtian, non-representational set, made almost entirely of painter’s scaffolding, by Sara Ryung Clement. Stephanie Kerley Schwartz’s simple costuming lets actors shift from character to character with ease. Annie Yee’s choreography, particularly when coupled with the nearly choreographic synchrony of more base movements, enhances the storytelling, while John Nobori’s sound design gives an important cultural texture to the piece. Go and see “The Golden Dragon”. There are levels of empathy which will stay with you long after you leave, though some of it proves disturbing the more one thinks about it. And there is an amazingly smooth, well articulated piece of performance to revel in. All this courtesy of the particular theatrical magic only live theater can make you believe. Ethical struggles, such as whether to help wounded combatants others want to watch die, mark “Seven Spots on the Sun” at The Theatre at Boston Court. In the traditions of much of the developing world, the mystical and the actual live in a particular balance with each other as the authors of truth. With this concept as backing, Martin Zimmerman’s play “Seven Spots on the Sun” examines how a people copes with the particular atrocities of modern civil war, balancing harsh reality and that underlying, deepening spiritual element. 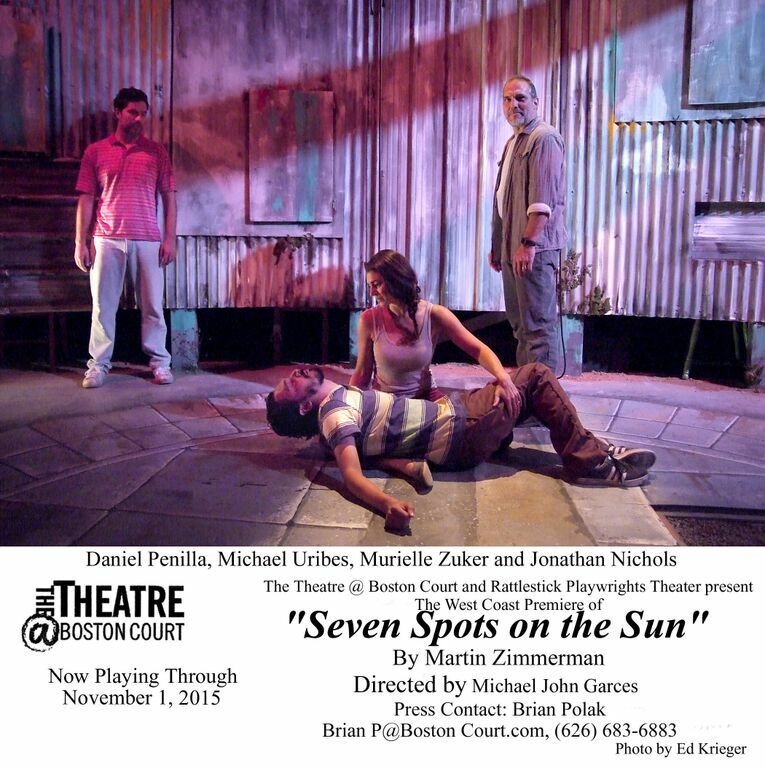 Now at The Theatre at Boston Court in Pasadena, “Seven Spots” proves riveting and wrenching as it explores the motives and consequences of the terrifying conflicts, which have afflicted, in this case, an unnamed Latin American country. Here, as in the real El Salvador, Nicaragua, Peru or Colombia, villages change hands multiple times, with each side punishing those who aided the other one, and brutal tests of fear which harm mostly those whose compassion drives them. The play begins on the day the post-war government declares an amnesty for all those who committed atrocities during the war, and how a small village – especially its healer and its priest – react. This plays against the flashback story of the young miner from a nearby town who, wanting the best for the wife he loves deeply, leaves the mine to enter the army just before the civil war begins. Gradually we become aware of how this young soldier’s life is twisted, and how that twist connects to the emotional upheaval in a village where amnesty means no satisfaction for great loss. As the determined healer, Jonathan Nichols offers up a man with little time for mystery as he maintains what sanity of life he can in a village often overrun. When it a miracle does descend upon him, its connection to great pain is evident in every move. As his wife and co-worker, Murielle Zuker offers up a confident idealist unready to be dashed on the rocks of brutality. Angelo McCabe completes the trio as the local priest whose fear finally gets the better of him, proving him only a man. Christopher Rivas radiates a kind of organic manliness as the miner turned soldier, and the decay in that confident joyfulness says much about the nature of war and the meaning of the play. As his happy, then concerned, then frightened wife, Natalie Camunas offers up the terror and frustration of a woman caught in the middle – needing something from those who were victimized by the good man she married who has devolved into a terrorizer. Director Michael John Garces keeps the story moving, and works the mystical and symbolic elements of this tale into the otherwise straightforward story with such precision that even the most outrageous elements of magic feel logical in the moment. The terror is realized in such a way as to create gut-level reactions from the audience while still leaving much to an imagination already seeded with awful possibilities. “Seven Spots on the Sun,” a reference to that cosmic condition which disrupts radio waves the way the war disrupts and blurs human lives, is performed without an intermission. It’s easy to understand why, as the intensity created in the first few minutes must continue to build to make the show’s overarching points about humanity and the limits to both forgiveness and empathy. Come ready to read between the lines and follow the symbols, and enjoy an intellectual feast even as you will squirm in your chair at how recognizable it all is. At a time when the entire concept of white privilege is under a microscope, it becomes especially fascinating to explore the larger concepts of European/American imperialism and what that process has done to the world we now live in. Most particularly, what has been lost as several centuries of the practice interfered with the natural self-development of the peoples of the earth. Which proves foundational to Aditi Brennan Kapil’s “Shiv,” now receiving its west coast premiere run at The Theatre at Boston Court. As the best introspective plays often are, this tale can be approached on a number of levels, but at its core it examines what is left behind when foundational cultures clash with dominant ones. It does so through the engaging story of one immigrant family from India. Shiv is the daughter of a small-town Indian family. Her father was, back home, a celebrated anti-imperialist modernist poet. He raises his daughter on the stories of his upbringing in the home gifted to his family by local royalty. There his competitive nature had full sway, and his pride of place brought him to prominence. Now he has come to the US, supposedly to give his daughter advantages in the western-controlled world, but at great cost to himself. His poetry does not translate well, and his daughter is left adrift, as both her father’s representative in this new world and the reminder of what he himself cannot do within it. All of this is seen through Shiv’s eyes, as she searches for the missing pieces of her father’s American narrative at the site of what were once a private publisher’s symposiums of Indian writers. Which, of course, is only one level of the play. Symbolism proves key, and the mystical elements of Indian belief and culture mesh with motifs of light and power in ways which make the show a full-body experience. Unpacking these deeper elements may take a while, but the work is worth it. Monika Jolly is Shiv, shifting back and forth from youth to adulthood with a seamlessness which underscores the central themes of the character’s struggles to balance the two parts of her life. Dileep Rao, as her father, manages to offer up external charm and internal desperation in the same breath, radiating hope toward his daughter at the same time as his own is evaporating in favor of cultural submission. As the operator of the country estate once a center for supposed cultural awareness, James Wagner displays an openness which allows Shiv to move forward in her own explorations of her cultural identities. In balance to this, Leonard Kelly-Young speaks as the gut-wrenchingly absolute imperialist, deciding with western eyes what to value of eastern art, as the professor who owns this estate, where Shiv works and searches for answers to her father’s mysteries. Indeed, it is Kelly-Young’s powerful albeit brief performance which underlines all the ugliness toward which the play has built. Under the direction of Emilie Beck, the production’s beautifully stark feel allows the many layered elements of this piece to coalesce. Stephanie Kerley-Schwartz’s imaginative setting allows Shiv’s character to float in her own imagination, tied only when she wants to be to the physical realities of the world around her. Tom Ontiveros’ integral video design fills the imagination and underscores the ethereal in the piece. By the end one cannot help but wonder, as the characters do, what India or any other nation absorbed by western empire would have been like if left to mature on its own. Indeed one symbol near the end sticks in the mind as a visual of the disconnect between east and west: a snow globe holding a miniature Taj Mahal. As Shiv notes, why would there ever be snow on the Taj Mahal? This, as with all things in this play, says many things at once. Yet, all of it proves engrossing from start to finish, and definitely worth the work of pondering after the fact. Go see “Shiv,” then take it home with you and let it steep awhile. The results will disturb the overly-confortable, but will voice what the modern world – American and otherwise – needs to hear. This play has been extended through October 19. Marc Cardiff will step in for Tony Shalhoub during the extension. When students study Samuel Beckett, it is almost always by reading or seeing “Waiting for Godot,” undoubtedly the playwright’s definitive masterpiece. As such, people go into a production of “Godot” with a certain knowing – a certain expectation of what may be found there. In other words, when it comes to Beckett, the potential for real surprise – something he was initially known for – comes from his less-produced, or at least less well known work. 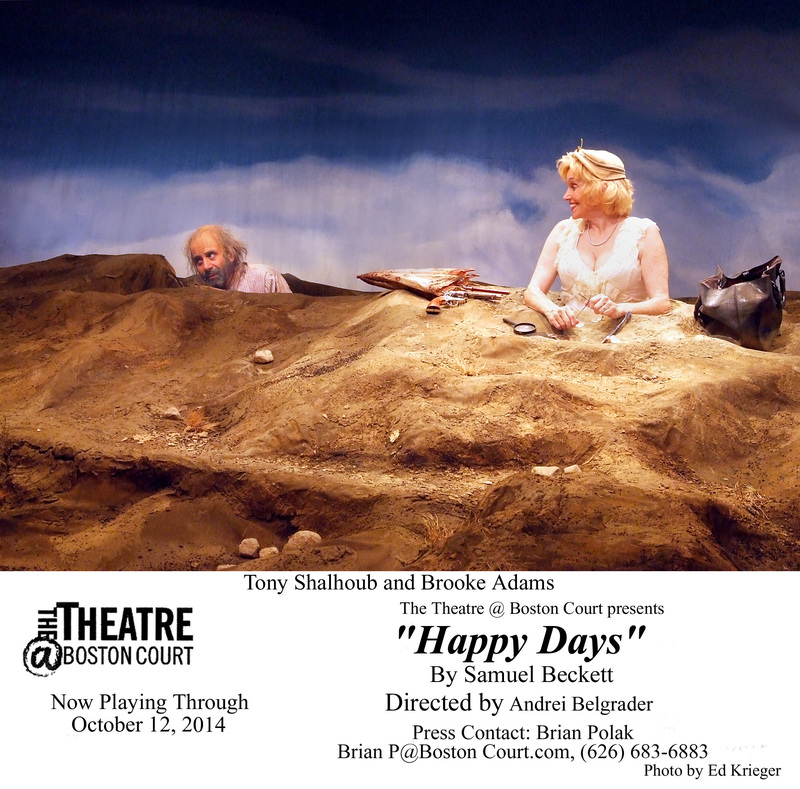 At The Theatre at Boston Court, the playwright’s “Happy Days” offers just such satisfying newness. Of course, it isn’t new, and yet though it was first produced in 1961, yes it is. Inspired by Cyril Cusack’s wife, Maureen, who suggested after “Krapp’s Last Tape” that Beckett “write a happy play,” it approaches much which still applies in the disaster which seems to be our modern society. The play which rises from that request by Maureen Cusack bases itself in utter despair, which the playwright felt only a woman would be able to face with dauntless cheerfulness. Whether or not this is a good thing, or any definition of happy, is open to interpretation. From the start, we meet Winnie – a woman already sunk to past the waist in the earth of a desolate place. Her husband Willie is in a cave somewhere behind her. He speaks little and usually somewhat unintelligibly. Still, knowing he is there gives this rather overbearing woman the strength to talk herself into buoyance, even as her situation becomes more and more starkly bleak. Of course, that’s only the superficial view. The toughness and indefatigable coping skills of a woman in the face of apocalypse, the constant stream of repetitive babble even when sleeplessness and hopelessness have given it all a grim undertone, say many complex things. There is much about social standards, marriage, and the elemental nature of womanhood, all to be gleaned as the evening matures. 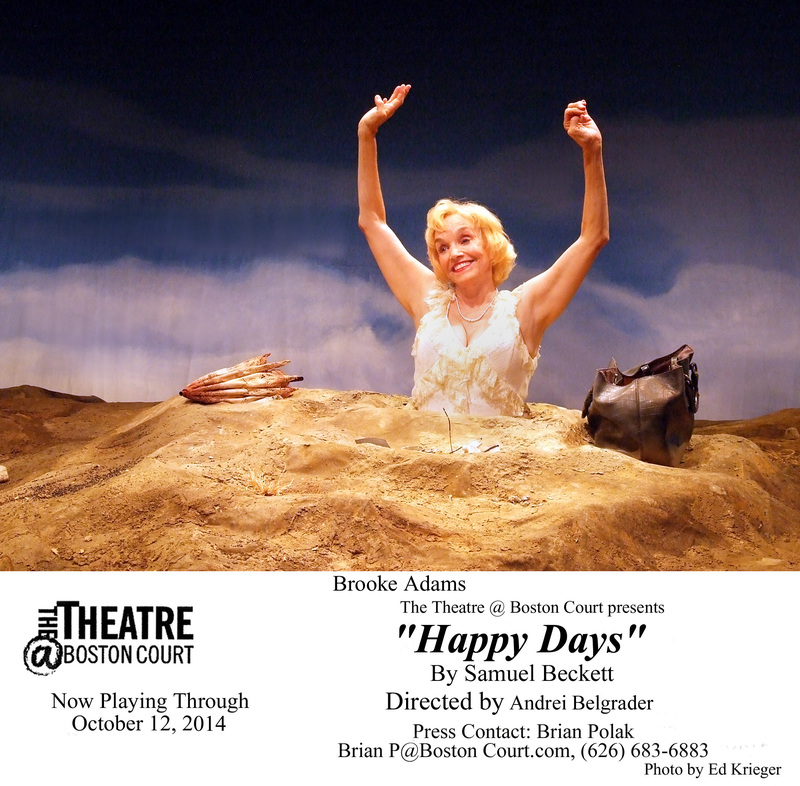 Winnie is often considered one of the great woman’s roles of the modern theater, and at the Boston Court, Brooke Adams is very much up to the task. In what is essentially a two-act monologue, done while unable to move anything but one’s arms and face, Adams takes us from cheery optimism, determinedly gauging each day as a “very happy day” to all that comes after: the gradual loss of faith and of actual, as opposed to imagined, hope as she sinks further and further into an overwhelming reality. Willie, an often thankless part made comical and quizzical by Tony Shalhoub (Adams’ husband), makes an important counterpoint to Winnie. In his grunts and monosyllabic commentary, Willie refuses to live up to expectations, or to answer when spoken to, even appears at times to have disappeared or died. Though the part proves minimal in scripted utterings, it is Willie who creates the question with which the play ends – a question even Beckett determinedly claimed he did not know the answer to. Director Andrei Belgrader balances the grim, unforgiving quality of set and situation with just enough humor to keep the darkness from descending too soon. He also establishes a pace which makes room for the performers’ art and interpretation without stretching the necessarily repetitive script to a point where the audience disengages. This is a major element in this production’s success. Takeshi Kata’s diorama-like set falls well into Beckett’s vision for the scene at hand. Melanie Watnick’s costumes evoke the barren, the bleached, the dirty and the worn. The thing looks right, which becomes particularly important in a play where setting is almost a character. In short, this play – like many others, new and old, produced at Boston Court – asks an audience to absorb, discuss and ponder. “Happy Days” may be listed as a classic, but not one commonly done. It proves most certainly to be a tour de force for Adams, and worth watching if only for that. For all these reasons, go see this “Happy Days”. Then feel free to ask yourself and everyone around you what the answer is to that ending question. You may learn much in the process.